Yup, you read right...that's BACKSTAGE with Aaron Carter. No, not the Aaron Carter concert, but BACKSTAGE! haha! 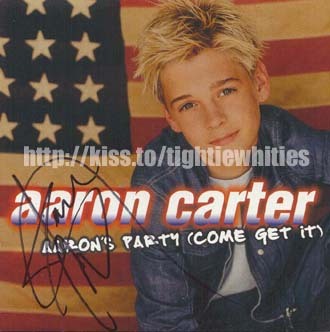 So, here's the story - the local radio station here in Toronto, Kiss 92, had a contest to go on "Aaron's Party Bus" to Ottawa, Ontario and catch the Aaron Carter concert. So, I entered the contest, thinking "It's not like I'm gonna win, but I'll just enter for the heck of it anyway." So you can imagine my surprise when they called me to tell me I had won! I started freaking out and totally tearing up cause you know, I NEVER EVER win anything...I swear, I have the WORST luck in the world, but whaddaya know! It says $0.00 cause it's free...cool eh? So, the bus was set to leave Toronto at noon on Friday, March 9th. So me and my three friends go down and meet the Kiss 92 people and the others people who won the contest. There were 10 winners and each winner got to bring 3 guests. One of my friends who went with me was *GASP* a guy! He doesn't particularly like Aaron Carter but he came anyway. (and thank God he did...you'll know why later) He was the only guy on the bus and it was kinda funny when everyone made a big deal out of it. But yeah...on with the story. So we board the bus, and the Kiss people tell us they've got a surprise for us. At that point, I kinda knew what it would be...and of course, I was right. 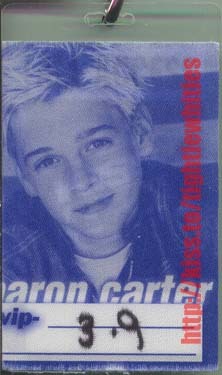 There will be a draw out of everyone on the bus for two people and a friend each to go backstage to meet Aaron Carter! So I was really excited, thinking how cool it'd be if I win. But the draw would come in a few hours cause it was gonna be a 4-hour bus ride. Well anyway, we watched 'Bring It On' on the bus (Brrrr...it's COLD in here! LOL) and the Kiss people were so nice as to give us free subs and drinks. (KISS RULES - everyone go listen to it!!) So, past the boring stuff. They had the draw after a while and so we all put our names down and put them in the bag. Then they had the draw, and guess who they drew? My friend Janice, and the guy!! So all four of us won backstage passes to meet Aaron. I was shocked out of my mind and started crying (yeah, I'm emotional, so what? LOL) cause ya know...I'm meeting Aaron Carter dammit! See that? We're Very Important People. After she sang, she had a little autograph session. I was the first to see her since I had an aisle seat. It was funny cause no one else noticed her but I'm just like...'Hey, that's Leslie!' LOL She's such a sweet girl, and incredibly polite - I got her autograph and she posed for a pic for me. Even though she isn't that big yet, it's nice to know she's not snobby or anything. There were a lot of opening acts for Aaron's concert. He had Leslie, Ricky J, and 11:30 open for him, and they each played really long sets. Then he only came on for like an hour - hour and a half or so. That was kinda weird but it was okay. So after a REALLY long time, Aaron finally came on and the real show started. He opened the show with 'Life Is A Party' and sang mostly songs from 'Aaron's Party'. It was a pretty good show actually. At the end, I sneaked up to the very, very front and that was really cool, cause I was touching the stage. It was loud though, cause the speakers were right next to me. hehe, not good. Leslie went on stage with Aaron for their last song and it was cool to see them sing together.